In the intro to this sequel, the evil Sultana turns to the audience to assure us that she will have her revenge, "and Deathstalker too," except it sounds as though she's actually saying, "I'll have my revenge in Deathstalker 2." And she says it directly to the camera, as the movie's title pops up. We could have included any one of a number of Monty Python examples. But this scene, when Zoot/Dingo actress Carol Cleveland turns to the audience to ask if this scene should be cut, actually was cut from the first video release of the film. This pre-Dogme Lars von Trier movie was surreal and Kafka-esque in the best way. In the opening second-person voiceover, Max von Sydow hypnotically counts down as the viewer travels deeper into the world of the film. This adaptation of the Virginia Woolf novella introduced everyone to Tilda Swinton, whose androgyny is perfect for the role. The film is framed by Orlando's memoir in voice-over, but Swinton frequently looks straight into the camera, using her face to sometimes echo, and sometimes undermine, what the voiceover is saying. The novel's expository conceit uses epigraphs from Princess Irulan's fictional books, histories, and biographies of the novel's key players. The film, which was, of course, directed by fourth-wall-destroyer David Lynch, adopts that conceit by having Irulan's giant head floating in space, speaking directly to the audience. She even fades out, and fades back in because she "forgot" to tell us the most important detail about the film, the source of the Spice. Animator Chuck Jones came out of retirement to work on Gremlins 2, and the film features an old-fashioned Warner Bros Looney Tunes intro, or seems to, until it gets stolen by Daffy Duck, who insists that he's the star now. Daffy reappears during the end credits to comment on how stupid they are, and to tell the audience to go home. Nobody ever really knows what to do with Michael Haneke's films. In Funny Games, which sets itself up as an intensely realist, intimate horror film, one of the young torturer-murderers is able to literally rewind the action and start a scene over, ensuring that he and his partner always win the "game." Woody Allen's most famous fourth-wall-breaking scene is this one, but The Purple Rose of Cairo is a really lovely, strange movie about a character who steps across the fourth wall and refuses to go back in, even when the actor who plays him insists on it. Ben Affleck plays Holden McNeil, whom Jay and Silent Bob visit to demand royalties from the movie based on the Bluntman and Chronic comic, which is based on their life. McNeil is bitter, and has sold his rights, and tells them that since the film is being made by Miramax, Matt Damon and Ben Affleck will probably be cast in it. Like the Pythons and David Lynch, Mel Brooks never met a fourth wall he didn't want to demolish, and Blazing Saddles is the most oft-cited example. 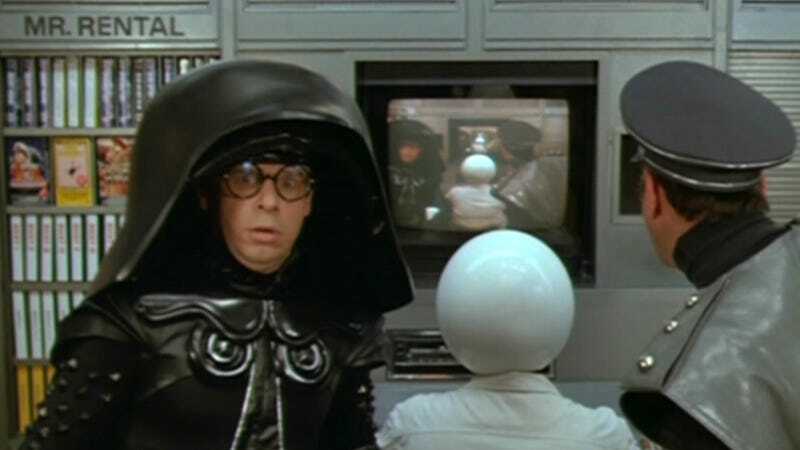 But Spaceballs gets points for being even more meta, when the characters in the movie watch themselves on a VHS tape and comment on the marketing of the video.